Hulu CEO Jason Kilar predicted in March 2011 that the company would earn half a billion dollars in revenue before the end of the year and while Hulu didn’t reach that goal the company still managed to pull in an impressive $420 million according to its official blog. While Hulu receives plenty of cash from paid ads (13.745 billion video ads viewed in 2011, up from about 11.711 billion in 2010) it was the company’s paid userbase that helped push up revenues so quickly. According to the company they now have more than 1.5 million monthly subscribers to Hulu Plus, a service that costs $7.99 per month. 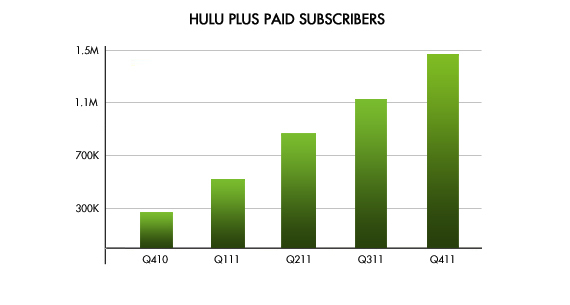 Hulu now expected subscription payments to account for half of Hulu’s business by the end of 2012. Hulu was also likely helped along by Netflix which lost more than 800,000 customers after raising its price floor by up to 60%. 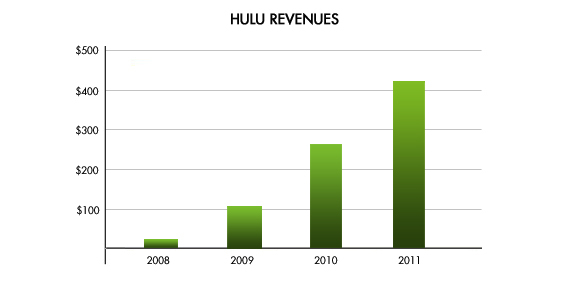 Are you surprised by Hulu’s growth in 2011? Given the video services tremendous growth I can’t say I’m surprised that they decided not to sell when the likes of Amazon and Google came knocking at their auction door. wow , great revenue , dont you?